Over the past few years members of Columbus’ swing dance community have grown accustomed to the once-a-month dance events held at the Columbus Maennerchor with live big band music by Columbus’ own 16-piece big band, Swing’s the Thing. Unfortunately business issues and the purchase of the Maennerchor property by Columbus City Schools for the expansion of Stewart Elementary led Swing’s the Thing to search for a new home. After a few months of searching, Swing’s the Thing is pleased to announce the resumption of LIVE dance performances at The Bluestone (formerly BOMA – 583 East Broad St., Columbus). The preliminary agreement is for 2 dance events – April 17 and May 15 from 7:00-10:00 pm. with their success determining whether a regular monthly event is established. In addition to the quality, live music, dancers are sure to enjoy cutting a rug on The Bluestone’s wood floor. Cover is $10 with group rates available – call Mark Watson (614-777-9971) for details. Grab your dancin’ shoes, a few friends, and come dance the night away to the sound of LIVE hits from the big band era with Columbus’ own 16 piece big band, Swing’s the Thing. Swing’s the Thing is based in central Ohio, and is comprised of musicians from numerous professions. Swing’s the Thing brings events to life with a diverse book of hits from a variety of artists and styles, while respecting the heritage and tradition of the big band era with standards from the books of legendary bandleaders such as Count Basie, Glenn Miller, Duke Ellington, and Stan Kenton. Swing’s the Thing’s repertory also covers a wide range of dance styles including swing, ballad, latin styles, waltz, disco, foxtrot and polka. 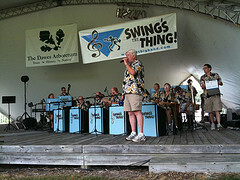 In recent years, Swing’s the Thing has performed for private parties and receptions, as well as numerous area concert series and events including: Gahanna’s Creekside Blues and Jazz Festival, Worthington’s Concerts on the Green series, Lancaster’s Friday Night at the Bandstand, Grove City’s Arts in the Alley and Summer Sizzle concert series, the Newark Jazz and Rib Fest, Dawes Arboretum, the Columbus Blue Jackets at Nationwide Arena, and the Columbus Clippers at Huntington Park.